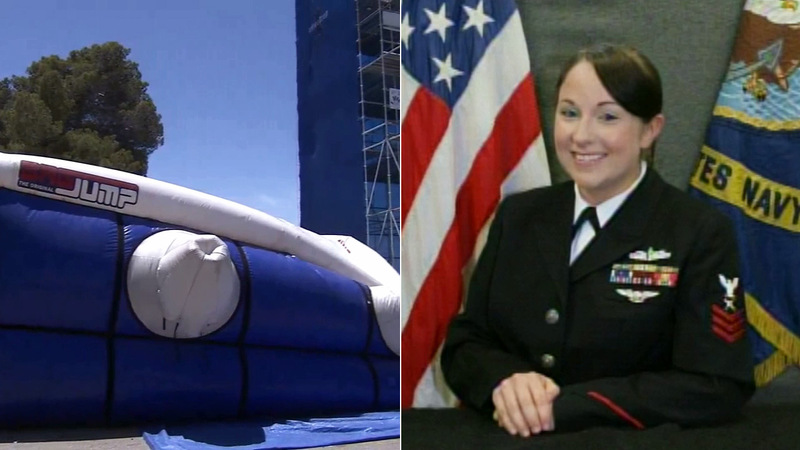 VICTORVILLE, CA -- A 31-year-old Navy veteran has died after falling from an extreme attraction at the San Bernardino County Fair in Victorville. Fire department officials said Sabrina Gordon suffered injuries after taking part in the "FreeDrop USA" attraction around 7:15 p.m. Thursday. The "FreeDrop USA" attraction involves people jumping off a platform nearly 40-feet high and then land onto a giant inflatable bag. The attraction was making its debut in California at the San Bernardino County Fair. The ride's owner said the attraction has had more than 50,000 successful jumps on a 36-city tour across the nation. Fair officials said the attraction has been shut down indefinitely. Gordon was working at a CrossFit booth at the fair when she decided to take the jump. She was a 10-year veteran with the U.S. Navy, where she worked in cryptology. Her father Lyle Bell told Eyewitness News that he's not sure exactly what happened, but it appears his daughter may have hit her head after jumping. "You get professional stunt people that do these things. You don't have 'Joe Blow' off the street for $15 jump out of a tower on an airbag. They're letting people do this down there," Bell said. "It's their first year there, and sure enough, somebody gets killed, my daughter." Bell described his daughter as outgoing and strong. He said she did whatever she set her mind to. "When my wife passed, it broke my heart, but this is even worse. Losing a child, you know, you should go before them," Bell said. "Safety is our top priority; the ride will be closed pending a thorough investigation by the San Bernardino county Sheriff's Department." While Gordon did sign a waiver for release of liability, her family says they're still planning to possibly file a lawsuit. Gordon lived in Hesperia with her husband.